Jews Top List of Most Popular Religious Groups in U.S. - Breaking Israel News | Latest News. Biblical Perspective. A new Pew Research Center survey finds that Americans are more positive toward religious groups today than they were only a few years ago. 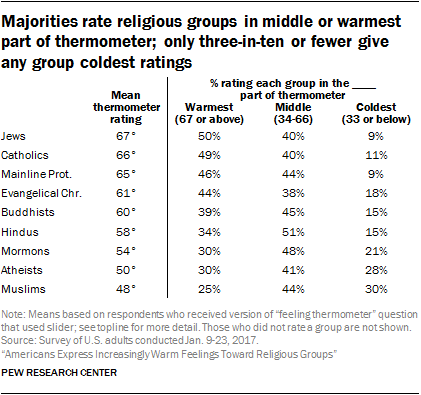 Asked to rate different groups on a “feeling thermometer” ranging from 0 to 100, Americans feel warmer about almost every group than they did in the same Pew survey back in June 2014. And Jews and Catholics continue to be among the groups that receive the warmest ratings. The ratings vary widely depending on who is being asked. Americans ages 18 to 29 express warmer feelings toward Muslims than do older Americans. In fact, young American adults rate all of the groups in the study within a tight range, starting with 54 degrees for Mormons to 66 for Buddhists. Americans ages 65 and older rate mainline Protestants (75) and Jews (74), very warmly, and dislike others, such as Muslims and atheists (44 each). The same survey also found that religious groups rate their own group most positively. Jewish respondents gave Jews an average rating of 91 degrees on the 0-to-100 scale. Catholics rated their own group at a warm 83. And self-described atheists rated atheists at 82. The data in this report are drawn from the panel wave conducted Jan. 9 to Jan. 23, 2017, among 4,248 respondents. The margin of sampling error for the full sample of 4,248 respondents is plus or minus 2.5 percentage points.